and Oj = jth encrypted input vector. And when we run this script, Voila ! (#flag is write at the end). Internet of Things (IoT) in terms of security is analogous to web in early 2000. As it is missing basic security properties like Authentication, Authorization and Confidentiality. We seem to have started the security process from scratch for IoT and there is a dire need for a framework which will translate already existing security properties for various protocols to the IoT specifics, as lot of them are not directly applicable. Lot of fellow Cryptographers are working on solutions implementing end-to-end-encryption as well as transparent and open crypto in a very usable way. Tools like TextSecure by Moxie Marlinspike and the Lets Encrypt initiative headed by EFF are some examples. As Jennifer Granick mentioned, this would be our basis to protect the dream of free Internet. We have a lot of new frameworks like node.js, Mongo Db and so on. The developers tend to assume that all these frameworks will take care of security automatically which they would if used within their architectural capabilities. So, a lot of security issues are popping up because of the failure to understand the architectural capability before using them. Talk on node.js attacks listed in this document is an example. Also noticed the “Assumed breach” model come up in a lot of discussions with other security researchers and it’s also being used heavily in terms of crypto agility and certificate Mgmt. Granick is the Director of Civil Liberties at the Stanford Center for Internet and Society and is known for representing Kevin Poulsen and Aaron Swartz before US criminal courts. In her speech, she spoke of the dream of Internet freedom: the freedom to exist without judgment (be it based on age, race, class, or gender), the freedom to communicate with anyone, anywhere, the freedom to access information, and the hands-on imperative – the freedom to explore and understand the technologies around us. We are now seeing a centralized, regulated Internet – one that is controlled based on decisions of those in power. It should be rather decentralized and should not be regulated by those with local concerns. Use of End-to-end encryption to break the cycle of power imbalances. Start creating technology for the next cycle of revolution or else Internet would become like TV. A perfect example of this is “Let’s Encrypt”  initiative by EFF, @bcrypt presented this at Defcon. Wen used a kernel Use-After-Free bug which was found in all versions of Linux kernel and successfully rooted most android devices (version>=4.3), including 64 bit devices. Essentially, they stumbled upon this bug while fuzzing using their customized Trinity fuzzer and they discovered a dangling file descriptor in the user space pointing to PING socket object in kernel. They were then able to spray user controlled data reliably into the kernel space and execute arbitrary code execution in the kernel, bypassing all the modern kernel mitigations like PXN. Sophia demonstrated the use of CPU out-of-order-execution to enable covert cross VM communication in cloud computing environments. This used three channel architectures: exfiltrating, infiltrating, and network as separate side channel. To do this, a pair of transmitting and receiving processes exploit the shared central processing unit. The transmitter must force out-of-order execution to occur and the receiver must record these occurrences. i) The first runs as a Native Client (NaCl) program and escalates privilege to escape from NaCl’s x86-64 sandbox, acquiring the ability to call the host OS’s syscalls directly. This was done by making use of CLFLUSH instruction. ii) The second runs as a normal x86-64 process on Linux and escalates privilege to gain access to all of physical memory. This is harder to mitigate on existing machines. In this attack Charlie and Chris demonstrated how it’s possible to remotely hack the Uconnect system of 2014 Jeep Cherokee over wi-fi as well as cellular network and then extending the attack to CAN bus service within the vehicle to control more sensitive controls like breaks, steering etc. They observed that Uconnect IP’s are exposed without Auth on Internet on two class-A address blocks: 21.0.0.0/8 or 25.0.0.0/8, which are presumably the address space Sprint reserves for vehicle IP addresses. And the port 6667 binds to the D-bus service on these IP’s. Moreover, Sprint doesn’t restrict two devices communicating to each other and hence they could send packets to port 6667 from their device to jailbreak Uconnect. Using Uconnect(or more precisely the OMAP chip) they flashed the V850 to install a malicious V850 and hence were able to craft packets to control CAN bus. Note: If you now do a port scan for port 6667, it will fail as Sprint has blocked it. And also recently Chrysler recalled 1.4 million vehicles which were potentially directly affected. TrackingPoint is an Austin based startup which makes precision guided firearms and these firearms ship with an ARM powered scope running a custom Linux version and a linked trigger mechanism. The task of the scope is to follow targets, calculate ballistics and increase users first shot accuracy. Apparently, scope also supports recording and streaming video and audio over wifi and its mobile applications. Essentially, the authors noted that admin API is un-authenticated, which gives un-authenticated access to core system functions and in addition any GPG key in trust DB can encrypt and sign updates. Using these authors controlled the scope and hence the target being fired. This talk does have a full exploit but I mostly liked it for the general information that they covered around SSRF, DNS profiling and Flash cross domain exploits w.r.t CDN’s. Yuriy discussed the attack surface on hypervisors w.r.t vulnerabilities in system firmware, as in BIOS or in hardware emulation. The attacks discussed were VMM DoS, hypervisor privilege escalation and SMM privilege escalation from within the virtual machines. He demoed the leaking of secrets using a firmware level rootkit in a very detailed way. They released new modules in open source CHIPSEC framework to test issues in hypervisors. Control flow guard technique checks the target of indirect call by calling ntdll!LdrpValidateUserCallTarget and raises an exception if target is invalid. Guard CF Check function pointer is usually initialized with the address of ntdll!LdrpValidateUserCallTarget when a module is loaded. Yunhai uses Jscript9 CustomHeap::Heap to make read-only memory writeable and then overwrites the Guard CF Check Function pointer to bypass CFG. This has been mitigated in windows by introducing a new function HeapPageAllocator::ProtectPages. This was an interesting talk on showing the effectiveness of applying deep learning techniques to disassembly in an effort to generate models designed to identify malware. They mention details of the whole pipeline, from raw binary extraction to transformation of disassembly data to training a deep learning model. This talk was not about demoing zero days or cool exploits but it was a very comprehensive walk through over the challenges and risk around the Big Data processing environment. The talk described the big data Security framework in detail and also covered the various risks involved in each layer. In case you’re unaware of the tradition, no mere plastic laminate is good enough for DEF CON. Over the years, the conference’s admission tags have morphed into a variety of charming and perplexing inventions, often incorporating circuit boards with chips, LEDs, and other components for attendees to try to hack. 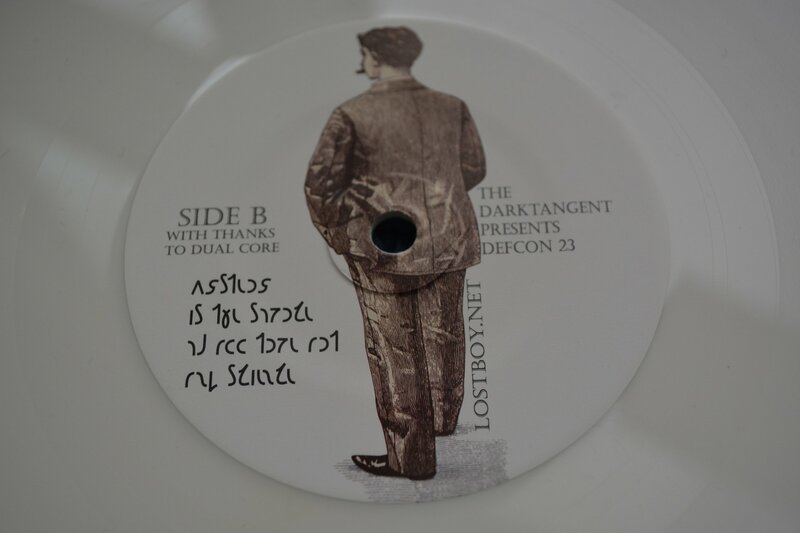 This year LostboY (@1o57) decided to go analog and DEFCON 23 badge was a playable 7-inch vinyl record as shown below. If you play the record, its starts with a synthesized voice reading the last few paras of Hacker Manifesto, followed by a female voice reading list of decimal numbers separated by dashes which includes the string “to June 18th 2024” and ends with a bunch of DMTF codes which seems to have 1057 (lostboy’s handle) as delimiter. There were bunch of other clues scattered across the whole conference setup like in the hotel keys, Shavian language on the badge, gold bug ciphers on the lanyards, information in the defcon newspaper etc. A few of them were misleading/distractions but all in all it was a fun setup. Crypto/Privacy Village, IoT Village, Social Engineering Village and Wireless Village. It’s automated the complete process of issuance and renewal of Certificates via ACME protocol which itself has been made on open source standard. It supports Certificate Transparency by default meaning all certificates issued or revoked will be publicly recorded and available for anyone to inspect. It’s free and painless to get a new Certificate within a couple of mins with >= security standards of existing CA’s. The whole code base of Let’s encrypt both server and client side implementation is open source. It is not controlled by one organization, EFF is launching it but is in collaboration with several other organizations. It is backed by Internet Security Research Group and hence is abreast with the latest security standards as and when they are updated. Aaron starts with the basics of how Linux containers works (container functions, namespaces, cgroups etc) and how to build system sandboxing using the kernel features focusing on LXC and Docker. He then talks about analysis and discussion of techniques for Linux kernel hardening, reduced capabilities, Mandatory Access Controls (MAC), and seccomp-bpf (syscall filtering). Finally he ends the talk with future of containers. This talk is about how you can maintain domain persistence once you have a handle to domain account. The techniques discussed/demoed included backdoor an administrator workstation, distributing signed Trojan administrator tools, stealing PKI keys, setting powershell as a debugger to something important etc. The talk also discussed few detection and remediation methods. This presentation talked about the mechanism of declaring someone dead and the process level vulnerabilities that can exploited to virtually kill off anyone and wipe them from the digital system. There is a lot more discussion is his talk and to be honest, this was scary and humorous at the same time. In my previous post, I gave a general introduction to HTTP Strict Transport Security (HSTS) and this post would be a follow up to that, talking specifically about “includeSubdomains” directive used in HSTS policy. If you are not familiar with HSTS, I suggest you read the previous post here, before reading this post. Suppose there exists a top-level DNS domain name for a website which is “anonymous.com” and a cookie is being set for the entire “anonymous.com”, this cookie is termed as “domain cookie”. Also, assume that the secure flag is set by the website (which actually means cookie can be sent only for HTTPS requests). The user’s browser (user agent) is unlikely to have any HSTS policy set for the domain, as it is some random sub-domain name introduced by the attacker. And if the browser makes a request to the “notlisted.anonymous.com”, this will send an HTTP request and also include the secure flagged cookie (as the registered domain is HTTPS). Assuming “notlisted.anonymous.com” presents a TLS certificate and the user clicks through it, this would lead to attacker obtaining the cookie . Here, the web application at “anonymous.com” domain, makes use of HSTS policy along with “includesSubdomains” directive. As a result, the browser will enforce any subdomain, even attacker’s “notlisted.anonymous.com” to operate over HTTPS. Thus, this would ensure adequate security for domain level cookie. 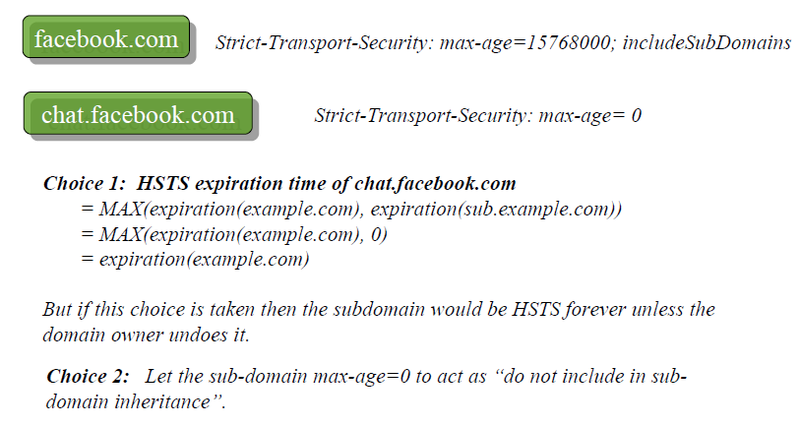 As shown in the figure 1, imagine the HSTS policy is first set for “facebook.com” along with the “includeSubdomains” directive, this will mean that all the sub-domains for facebook.com including “chat.facebook.com” needs to follow the HSTS policy. Now, following this if the subdomain “chat.facebook.com” sets the max-age = 0 header, it basically means remove any HSTS policy for “chat.facebook.com“. Secondly, letting the sub-domain max-age =0 to act as “do not include in sub-domain inheritance”, which though seems to be reasonable but is not. As essentially the policy is set at parent domain i.e. the naked domain facebook.com and not at sub-domain level. And letting the sub-domain to change the parent domain policy is not an appropriate approach. Currently, Chrome’s implementation takes the first option; though there are possible work around to avoid sub-domain from being HSTS forever, there is no clean/clear way to handle it (even RFC doesn’t specify anything directly). PS:- I am not sure how this is handled in Firefox or Safari, if you have any references please leave it as a comment. It is possible, but not certain, that one may obtain a requisite certificate for such a domain name such that a warning may or may not appear. The concept of HTTPS, that is having the web traffic from your browser to the web server over an encrypted channel is widely used over the web. It ensures that no attacker in the middle can grab or modify transmitted information like your cookie data; hence preventing the hijacking of your web session. So, enabling HTTPS limits the capability of an attacker in the middle. How can Man-in-the-middle (MITM) attacker work around HTTPS ? Mostly when users wants to browse a website, for instance say bank of america website, they would generally type “bankofamerica” or “www.bankofamerica.com” in their browser address bar. On this browser would basically make an HTTP request to bankofamerica.com i.e. http://www.bankofamerica.com, even though bank website operates as https://www.bankofamerica.com. So, to rectify that bank website can redirect the HTTP request to HTTPS (by issuing a 302 re-direct), but it still leaves your HTTP request to the bank, vulnerable to attack by MITM before the actual redirection happens. The SSL-stripping MITM attack introduced by Moxie Marlinspike in his 2009 BlackHat Federal talk “New Tricks For Defeating SSL In Practice“, exploits this vulnerability. It would be much more safer if the HTTP request can be totally avoided and the browser itself knows that it should connect to the website over HTTPS. This is exactly what HTTP Strict Transport Security (HSTS) is meant to address. would instruct the browser that the website sending this header should be accessed only over HTTPS for a year (as per max-age). Thus, the use of this header reduces the attack surface drastically: provided that the initial response (bootstrapping response) by the server reaches the browser without interception. Currently, HSTS has been implemented in Firefox, Chrome and Opera; though it is still to implemented in IE and Safari. The updated browser trends for HSTS and other features can be seen at BrowserScope. Can we do something about HSTS Bootstrap MITM problem? As we have seen that initial response from the web server which has the HSTS header should reach non-intercepted to the browser, in order to ensure complete security from adversary. This problem is referred to as Bootstrap MITM Vulnerability. One possible solution is to have a pre-loaded list of hosts in the browser for which HSTS would be on-by-default. Firefox and Chrome already support a pre-loaded list of hosts which want HSTS on by default. Chrome’s pre-loaded list can be seen here. Another potential solution is to include the HSTS information with DNSSec requests itself. Though, I have not come across any references which implement or mention details about it. What HSTS is not meant for? Phishing Attack: Rather, it complements many existing phishing defenses by instructing the browser to protect session integrity and long-lived authentication tokens. Malware: As malicious code executing on the user’s system can compromise a browser session, regardless of whether HSTS is used.